My kids both flew before they were old enough to really understand that this was anything more momentous that the other random outings we took them on, and we've flown enough with them over the years to have (luckily) avoided any travel worries from them. So, we're not really the target audience for My First Plane Trip, a short picture book by Kim Jenkins. Still, I like to try to help authors out when I can, so I agreed to take a review copy. And then proceeded to get really busy, so it has been over a month and I'm only now posting the review. I read the book and Pumpkin (who is eight) read the book. I think Petunia (who will be six in a few months) might be more in the target age range for the book, but she was basically a walking meltdown tonight due to an unfortunate incident at camp with some sunscreen and her eye, so I didn't think it was worth asking her opinion. All of her opinions tonight degenerated rather quickly into tears. 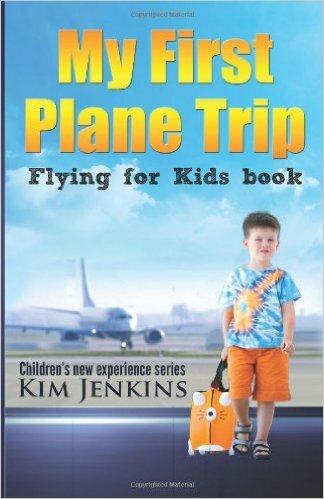 The book is a straight-forward explanation of the things a child is likely to see and experience when taking a trip on an airplane. There is also a list of "People You Might Meet" and a glossary, which I think may have been Pumpkin's favorite parts. Both Pumpkin and I rated this book as "fine." We both thought it did a solid job of explaining the air travel process to a child who wasn't familiar with it. The book is illustrated with photos, which might be a nice feature in terms of helping kids recognize what they're seeing on the day of the trip. Some of the pictures are clearly stock photos, but there was only one case where that bothered me: the photo illustrating baggage loading shows bundled freight being loaded. There is some humor provided by funny cat photos and the incongruous appearance of a porcupine. This humor worked better for me than it did for Pumpkin- she took it too literally and said "no one would travel with a porcupine!" (I decided not to explain to her that was sort of the point of the use of the porcupine.) I think this is a case where a younger child who is in a less literal humor stage would enjoy the humor more than Pumpkin did. Pumpkin is solidly in the scatological humor phase, so probably would only have laughed if the porcupine had farted. I had one other content concern: there was a page about the airport stores, which might be a bad thing if you were hoping to avoid shopping in the stores during your time in the airport. We usually buy an overpriced snack in one of the airport stores to take the edge of waiting, but I know some parents try to avoid them. I had a PDF version, so I can't comment on the ebook layout, but the text was well-edited, age appropriate, and easy to read. All in all, I think the ebook version of this book would be a good investment if you have a child under the age of six or so who is about to take their first airplane ride. I'm not sure I think the cost of the print version would be justified for most kids, but if I had a child who was fearful of the new experience, I'd give it a try. I occasionally accept a review copy of a book to review. My review policy is explained on my page about book reviews. A PDF version of the book in this post was sent to me by the author. We don't have any plans to travel by plane with Baguette just yet, but we need something like this. Thanks! Thank-you for admitting that there are nights when kids melt down and nothing can help. We need more realism about family life. I think this book would help a child any time they fly. 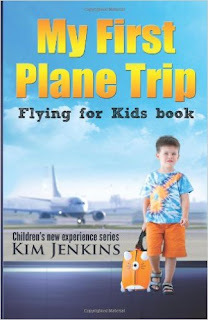 It is also a good read about an airplane trip even if a child hasn't flown or isn't planning to yet. They would hear about these things in school and on television. The pictures were good and the bits of humor were just right for a child. I like the glossary in the back explaining some of the terms used in the book that relate to an airport and airplane trip.